Pancreatic safety of GLP-1-based therapeutic agents: further insights from rodent studies? In this issue of Diabetologia, Ellenbroek and colleagues present a study of the effects of the glucagon-like peptide-1 (GLP-1) receptor agonist, liraglutide, on beta cell function and mass in normoglycaemic mice . The mice were treated with liraglutide at 0.1 mg/kg twice daily (a high but reasonable dose) for either 1 or 6 weeks while they received either a control diet or a high fat diet. Compared with controls, liraglutide improved insulin resistance and attenuated resistance induced by high fat feeding. In the pancreas, a lower beta cell mass was observed in the liraglutide-treated group, which was associated with decreased proliferation of beta cells at 1 week. Despite this, islets isolated from treated mice showed enhanced glucose-stimulated insulin secretion. There was a similar reduction in alpha cell mass such that the alpha to beta cell ratio was preserved. In contrast, acinar cells showed a significantly higher number of proliferating cells following liraglutide treatment in both control and high fat fed mice (as measured using BrdU incorporation), and total pancreatic mass increased somewhat after 6 weeks. Duct cells did not show proliferation. There were no signs of inflammation and levels of pro-inflammatory cytokines were similar in all groups. These results are interesting in many ways. First, the reported effect on beta cell mass is consistent with the view that beta cell mass in rodents is predominantly regulated by glucose . Thus, the proliferative effects of GLP-1 and GLP-1 agonists are mainly observed in hyperglycaemic animals. Bock et al  observed that the effect of liraglutide on beta cell mass (evaluated by stereology, the most reliable technique for morphometric analysis) in normoglycaemic rats was transient, supporting the view that glycaemic regulation overrides the effects of incretins. The lower beta cell mass observed by Ellenbroek et al is consistent with a glucose-lowering effect of GLP-1 even at basal levels . The positive effects on insulin sensitivity and glucose tolerance are in line with those observed in human studies , although the mechanism in normoglycaemic animals is unclear. The question is whether or not GLP-1 directly affects peripheral insulin-sensitive tissues (muscle and fat); this has been reported in rodents , but is perhaps less likely to occur in humans [7, 8], where improvements in patients with diabetes are generally thought to reflect improved metabolism and weight loss . Weight loss may also play a role in the present study , as liraglutide treatment reduced body weight in control and high fat fed mice. A new finding in this study is that alpha cell mass was reduced similarly to beta cell mass . Initially, this would appear consistent with the inhibitory effect of GLP-1 on alpha cell secretion . However, the mechanism behind the inhibition is far from clear: in contrast to beta cells, it is highly controversial whether or not alpha cells express GLP-1 receptors, with reports ranging from no receptors  to 20% of alpha cells expressing them . A cautious guess might be that the expression level is low . It is equally uncertain how GLP-1 lowers glucagon secretion (GLP-1 was even reported to stimulate secretion in isolated alpha cells [13, 14]), but several observations indicate that the inhibition is indirect, resulting from the inhibitory actions of hormones or agents released from neighbouring islet cells (such as somatostatin  and beta cell products ). The results obtained by Ellenbroek et al  appear at a time when new findings regarding the effects of GLP-1-based therapies have questioned the safety of these therapies. 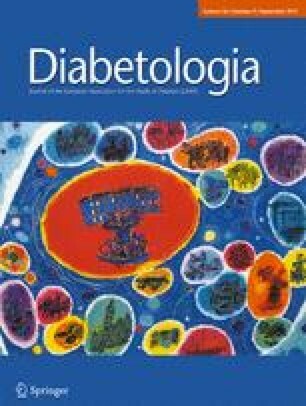 In an online report in Diabetes a team of workers from Los Angeles and Florida reported pancreatic morphological changes in eight diabetes patients treated with GLP-1-based therapies (seven with the dipeptidyl peptidase-4 [DPP-4] inhibitor, sitagliptin, one with exenatide) for less than a year . The pancreatic tissue specimens were obtained freshly post mortem through a collaboration with the Network for Pancreatic Organ Donors with Diabetes (nPOD) funded by the JDRF to promote type 1 diabetes research, and compared with tissue from 12 diabetic patients not receiving GLP-1-based therapies and a group of nondiabetic donors. As one can imagine, the groups were extremely heterogeneous with widely differing circumstances leading to a final hospital stay, e.g. in intensive care units, and to death. The main findings in incretin-treated individuals were a 40% increase in pancreatic mass accompanied by increased proliferation of exocrine cells as well as dysplasia in the form of: intraepithelial neoplasia; hyperplasia of beta and alpha cells (five- to sixfold increases); increased frequency of cells co-staining for insulin and glucagon; peri-/intraductal luminal projections of glucagon immunoreactive cells; and glucagon-producing microadenomas in three donors, one of whom also had a glucagon-producing tumour. There were no signs of pancreatitis in any of the pancreases examined. The study has been heavily criticised, particularly because of the heterogeneity of the groups [17, 18]. Particularly important is a mean 18 year age difference between incretin treated and non-incretin treated patients with diabetes. However, the studies by Ellenbroek et al  and Butler et al  have in common an increase in the mass of the (exocrine) pancreas. Do GLP-1 and GLP-1 receptor agonists cause pancreatic growth? And if they do, what does that mean for treatment safety? Pancreatic growth is generally not reported in the studies available to date. It is also unclear whether or not GLP-1 receptors are expressed in the acinar tissue. However, it should be noted that exenatide was originally isolated using a bioassay based on cAMP accumulation in guinea pig pancreatic acini , indicating that exenatide must somehow interact with this tissue (although it may be possible that the acinus preparations could have been contaminated with islet cells). It has also been reported that exenatide enhances cholecystokinin-induced pancreatic enzyme secretion (but has little effect alone) , perhaps consistent with reports of slightly raised lipase levels during GLP-1 agonist therapy . In preclinical studies provided by the pharmaceutical companies for registration of GLP-1-based therapeutics, increases in pancreatic mass have not been reported , and in one study of exenatide, pancreas mass was actually reduced . In extensive studies on the pancreatic effects of liraglutide, Nyborg et al examined pancreases from 1,438 animals, of which more than 1,000 were treated for 2 years (lifetime) at up to 60-fold higher doses than the equivalent human therapeutic doses ; increases in pancreas size were not noted, and in monkeys followed for 87 weeks of therapy there was no growth of the pancreas. However, a study by Koehler et al of exenatide and liraglutide in mice  found increases in pancreatic size (not associated with inflammation), and in female (but not in male) monkeys given liraglutide for 52 weeks there was apparently an increase in pancreas mass (mentioned in a news report in the British Medical Journal ), contrasting with the lack of effect in the 87 week study in monkeys . Thus, it is difficult to conclude anything from the preclinical studies. In the cases where an increase was observed, this was not associated with inflammation (i.e. pancreatitis). The human pancreas donor study by Butler et al  included only one patient treated with a GLP-1 agonist (exenatide), whereas the others were treated with the DPP-4 inhibitor sitagliptin, for which there are no preclinical data (derived from extensive studies ) suggesting growth of the pancreas or any other pathology. It should also be considered that GLP-1 plasma levels during DPP-4 inhibitor treatment are only slightly elevated and still fall within the normal range . Rather, it should be noted that the diabetic control group in the donor study  probably included several (or a majority of) pancreases from patients with type 1 diabetes, which are known to be smaller than those of controls . A similar reservation applies to the observed beta cell hyperplasia: some years ago a trophic effect on beta cells would have been received with enthusiasm, because it would support notions of protective or restitutive effects of the GLP-1 therapies on beta cells, but despite the potential to enhance beta cell mass in young rodents , no studies so far have revealed beta cell tumours (insulinomas) resulting from GLP-1 therapies, consistent with the concept that GLP-1 therapy does not enhance beta cell mass in humans . The reduction in alpha cell mass in the mouse study by Ellenbroek et al  also contrasts with Butler’s finding of alpha cell hyperplasia . However, in humans, similar, clearly age-dependent changes have been observed in autopsy studies [31, 32] suggesting that the Butler observations are mainly due to the age difference between the groups. The hyperplasia in the Butler study led some to think of the alpha cell hyperplasia that has been observed in mice with glucagon receptor mutations and animals treated with glucagon antagonists [33, 34], based on the idea that, if GLP-1 therapies inhibit glucagon secretion, they may also cause alpha cell hyperplasia. However, the hyperplasia found in glucagon receptor knockout mice is due to a hepatic factor and is not observed after selective knockout of glucagon receptors in the pancreas . More importantly, any hyperplasia is invariably and immediately associated with hyperglucagonaemia , which has never been observed as a consequence of GLP-1-based therapies, which lower glucagon levels. Duct changes similar to those observed by Butler et al  have not generally been observed in preclinical studies except in transgenic mice with mutated Kras genes leading to inflammation , and therefore would be suspected to result more from the mutations than from therapy. Again, the 18 year age difference between the GLP-1 treated patients and the controls in Butler’s study should be kept in mind, since it is well established that pancreatic pathologies (including pancreatic intraepithelial neoplasias [PanINs]) increase considerably with age. In conclusion, the study by Ellenbroek et al  does raise the question of whether GLP-1 agonism under certain circumstances may have a (possibly transient) trophic effect on the pancreatic acinar tissue in mice (but apparently not in rats), but importantly this seems never to be related to inflammation, and cannot be interpreted to support the observations by Butler et al . The results regarding endocrine changes also provide no mechanistic support for a causal relationship between GLP-1-based therapies and the other observations made by Butler et al. A conference held by the NIH on June 12–13 2013 (www2.niddk.nih.gov/News/Calendar/PDPC2013) discussed many of the issues mentioned above and expressed very similar views. JJH has been consulting with NovoNordisk, Sanofi, GSK, Bristol-Myers Squibb, MSD and Zealand and is currently receiving research support from MSD.